Premature balding and rampant hair loss can really take a toll on your confidence level. 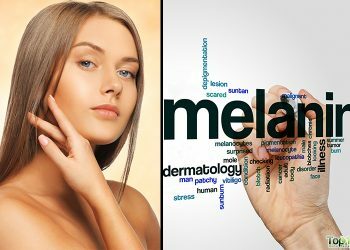 Apart from making you look older than your age, the nuisance and embarrassment of leaving a trail of loose hair behind wherever you go make this condition especially woeful. The exorbitant prices of the top-of-the-shelf hair products that are marketed as the sole solution for your condition will further drive you up the wall, or worse, urge you to pull your hair out. However, there is absolutely no need for your tresses to be one of your stresses, particularly so if you have some onions and honey lying about in your kitchen. These two culinary staples are all you need to restore your hair to its voluminous glory. 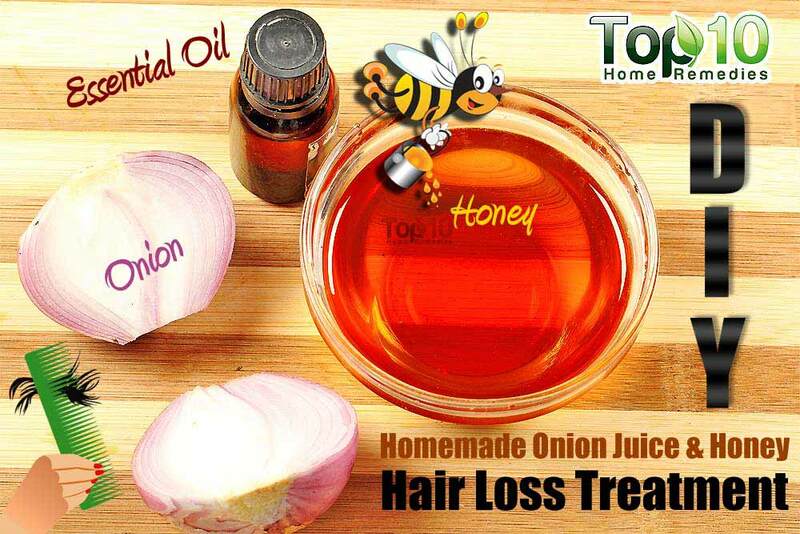 If research-backed studies are to be believed, onion juice is one of the best home remedies to put a brake on hair thinning and breakage, and subsequent hair loss. This hair-promoting property of onions can be attributed to its sulfur content, which improves blood circulation, stimulates hair follicles, and promotes hair regrowth. Moreover, sulfur is considered one of the primary building blocks of hair itself, as it aids the synthesis of major enzymes and proteins like collagen and keratin. Collagen, in turn, renews cells to maintain the suppleness, elasticity, and strength of hair. 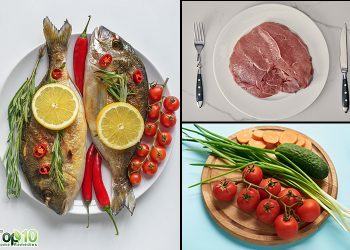 Many amino acids, the building blocks of protein, have a sulfur component. Keratin is one such fibrous protein that boasts large amounts of sulfur-containing amino acids. 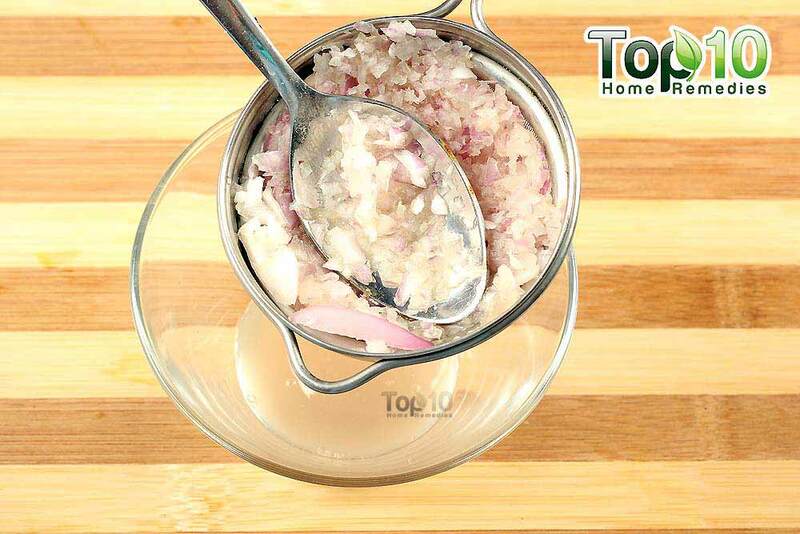 Furthermore, onion juice offers the added advantage of killing dandruff-causing bacteria and is also great for reversing premature graying of the hair. A study published in the Journal of Dermatology in 2002 found that participants suffering from Alopecia Areata who applied onion juice to their scalp twice daily for 2 months had a significantly higher rate of hair regrowth than those who used tap water instead. The results were starker and more evident amongst males than females. The following remedy also capitalizes on the quality-enhancing capabilities of honey for your hair, as it helps restore the shine and smoothness to your damaged strands. Owing to a rich composition of antioxidants, nutrients, and vitamins and being a natural humectant, this “Nectar of the Gods” works to seal in the moisture of the hair and prevent it from undue breakage. 1. Peel, chop, and blend the onion. 2. Put the blended pulp in a strainer. Using a spoon, press the pulp to extract the juice. 3. 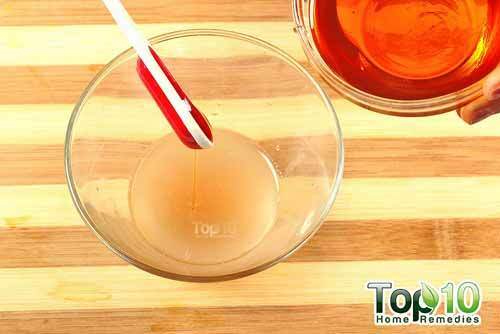 Add 1 to 2 teaspoons of honey to the onion juice. 4. Optionally, add a few drops of essential oil, such as lavender oil. 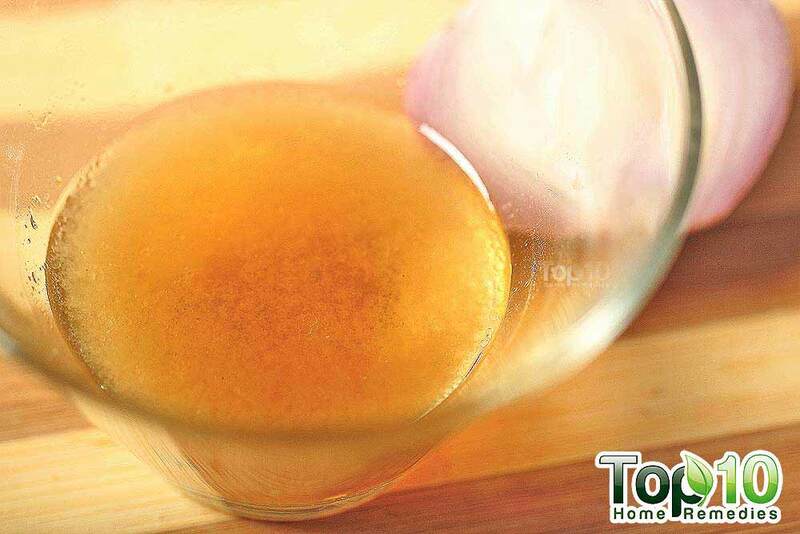 Your homemade onion juice and honey treatment is now ready. 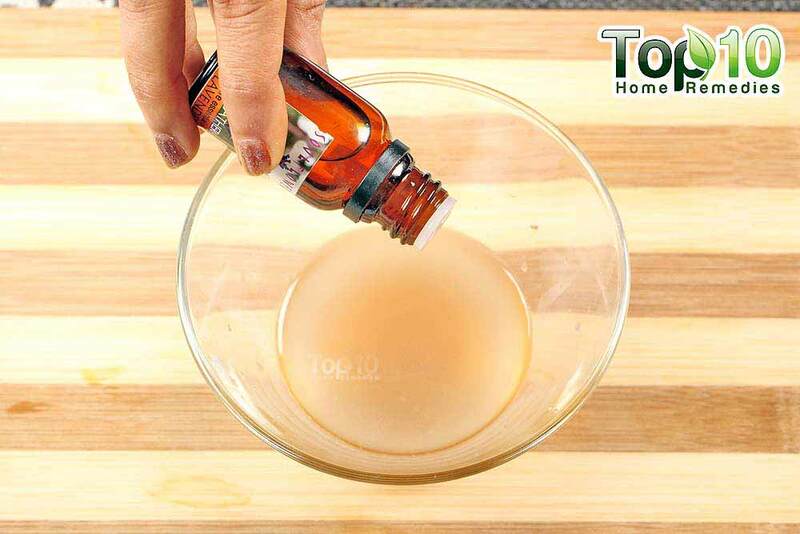 Massage your bald patches or entire scalp with this mixture. Cover your hair with a shower cap and leave it on overnight or at least for 30 minutes. Rinse your hair the next morning. Follow this hair loss treatment daily for a few months or until you are satisfied with the results. 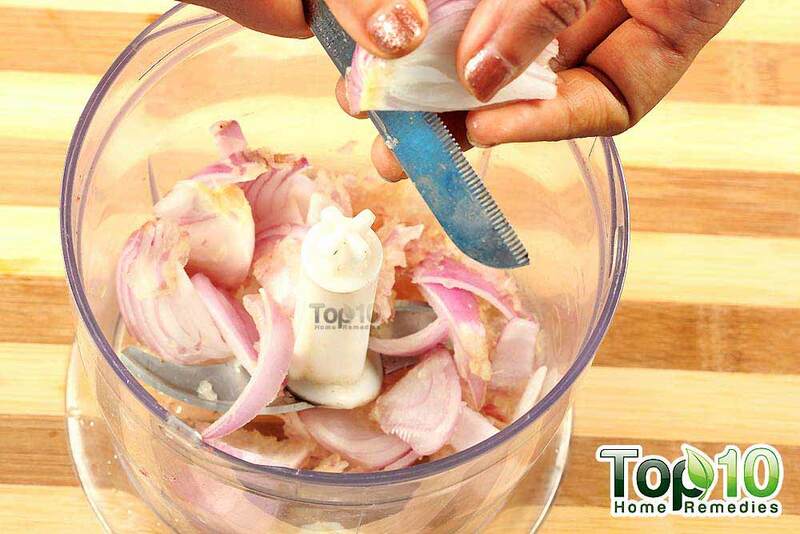 Instead of blending the onion, you can grate it and then extract the juice. To squeeze the juice out, you can use cheesecloth instead of a strainer. You can also use a juicer. To avoid tearing up while cutting the onion, chill it in the freezer for about 15 minutes and then chop it. If you want to add a fragrant essential oil to counter the pungent odor of onions, use rosemary, lavender, peppermint, or other similar oils that promote hair growth. 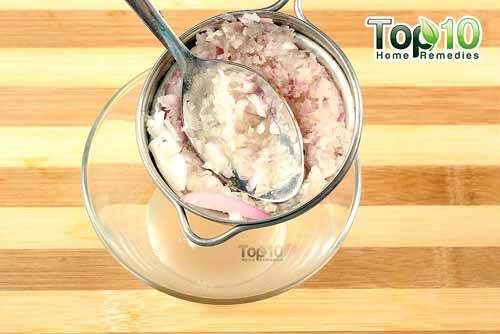 You can also add some lemon juice or rose water to mask the onion smell. Liguori L, Califano R, Albanese D, Raimo F. Chemical Composition and Antioxidant Properties of Five White Onion (Allium cepa L.) Landraces. Journal of Food Quality. https://www.hindawi.com/journals/jfq/2017/6873651/. Published January 15, 2017. Velasco MVR, Dias TCde S, Freitas AZde, et al. 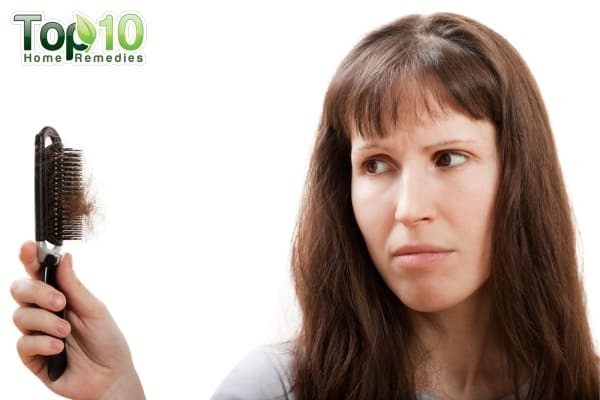 Hair fiber characteristics and methods to evaluate hair physical and mechanical properties. Brazilian Journal of Pharmaceutical Sciences. 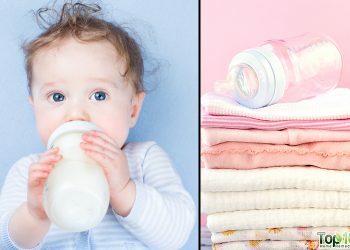 http://www.revistas.usp.br/bjps/article/view/10666. Published 2009. Sharquie KE, Al-Obaidi HK. Onion juice (Allium cepa L.), a new topical treatment for alopecia areata. The Journal of Dermatology. https://www.ncbi.nlm.nih.gov/pubmed/12126069. Published June 2002. Thank you very much.God bless. 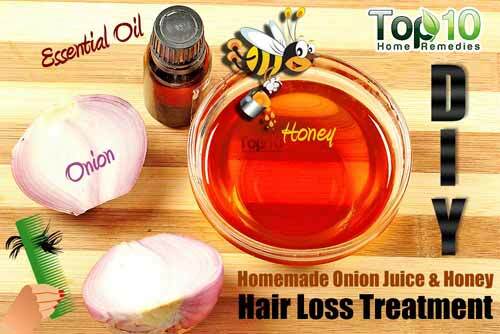 Onion juice or paste prevents hair fall and stimulates hair growth. nice one, keep informing us. I must try this. god bless.